Risk/Reward is Good on the Swissy? It was literally only last week that I was looking for a bounce and a trade to the upside in the Swissy. As it turns out we got the move I had been looking for, but now, a week later, things have turned bearish. The FOMC has cast a fair bit of doubt over the short-term bull trade in the USD. As a result, I think there might be a bit of follow through to the downside. 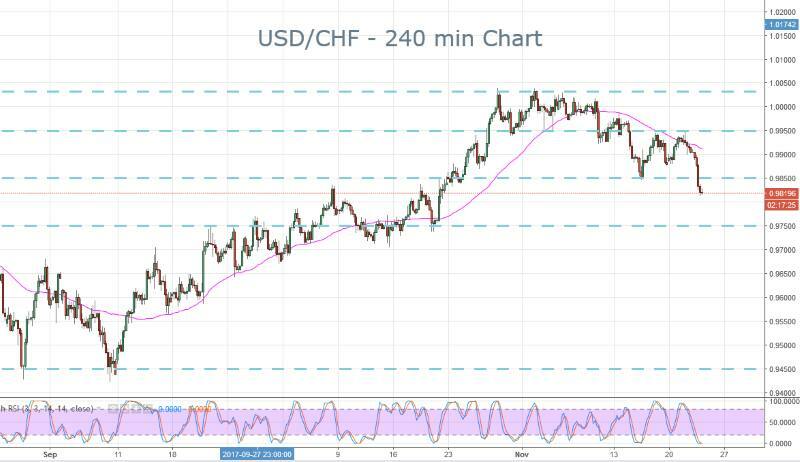 The USD/CHF is one pair that we can use to capitalize on that move. I think the next big level in the USD/CHF is 0.9850. If we are to get more weakness then there is a fair bit of room to the downside. If we are to retrace then it’s really not all that far back to the range we were just in. Of course, we need some follow through and the price action will let us know. I’m going to wait and see if there is any more movement in the USD on Thursday and if so, this might be a trade to consider. Of course, don’t forget the holiday period in the US which is going to significantly reduce volumes and the scope of any moves for the remainder of the week. USD/CHF – 240 min Chart.